There are many reasons why I find myself continuing to participate in the many ultra events that I do. Many of those reasons I find hard to explain to others outside the sport, and that is mainly because I don't think I quite understand it myself. But the one thing that is easy to understand is why I enjoy the many special people I've met through this sport and in being a member of the running clubs in the area. There is great personal satisfaction in completing a tough run but it is nearly as much so to watch your friends do well, especially when they are newcomers to the sport or going for a special goal. One of the great benefits of volunteering is being a small part of the successful completion of a tough event. I know my successes have been helped so much by the support and care from volunteers and friends and their family's crewing. At this years Umstead there were so many runners attempting to finish their first 100 miler and out of 104 finishers, 38 completed the distance for the first time. We probably had more participation from the Mangum Track Club than any other group this year and quite a few of those were first timers. Some of our relatively new members that got their first finishes were Cameron Kelly, and Frank and Donna Maguire. Of all the runners in the race Mark Long probably had the most people pulling for him. Mark along with Doug Dawkins are the true heart and soul of the MTC. Since Mark's first attempt at the hundred in 1994, he had not been able to quite put together a successful race and had failed in several attempts here at Umstead. After being able to stay awake all night at last Fall's Hinson Lake 24hr run his confidence seemed to grow knowing that it was possible to fight the sleep monster. And with a relaxed attitude and better pacing he finally got that elusive 100 mile finishers buckle. Another MTC member and NCRC former president Ben Dillon also got his buckle. Ben has been very active in volunteering for probably the entire existence of the race and ran the 50 miler several years ago. He always said he had no interest in doing the 100 but over the past couple of years Ben had began to run more ultra's and made the decision to go for it. Ben ran a smart steady race and just cracked 26 hours in his first attempt. Another NCRC member and current club board member Jennifer Frahm would also being going for her first. She probably had the most meticulous plan of anyone in the race and although things got tough late in the run, she persevered and got her finishers pendant and was 1st female in the 20-29 age-group. A couple of out of state friends also came for their first. John Straub from PA came down. Unfortunately his wife Debbie, also an ultrarunner couldn't make the trip due to recent surgery on her calves but John ran a very strong 20:40 finishing 10th overall. Rick Gray came over from Tenn. with his wife Tammy along for support. I was a bit surprised to learn that Rick was a first timer as he is a very strong runner but he certainly didn't perform like it was his first and was close behind John at the finish in 20:48. Rick and Tammy are one of the nicest couples you can meet and it was nice to have both of them offering encouragement to me all day. Which brings me to a couple of my favorites. Dorothy Hunter is a charter member in the Ultraman Joey's Angels and Princesses Club. She has been running ultra's for about 9 years now I think and was a David Horton student at Liberty. I first remember seeing her at some of my first Ultra's in Virginia but it was at the first GEER 50K in 2003 that I met her and future husband Todd at the finish line. Since that time I have shared many miles on the trail with Dorothy and it is always a pleasure to be in her company. Tiny, petite and adorable but with the heart of a lioness, she is always a strong competitor that won't quit. I had no doubt that she would not only finish but do great. I was a little worried though when I saw her out training a couple of weeks before and she had a chest cold and looked terrible. Luckily she recovered in in time and ran a great race. Everyone that saw her on the course all day could see her smiling and having a great time. I was happy to be at the lodge when she finished to congratulate her and give her a hug. 23:09. An awesome run and 3rd in her age-group. I wouldn't have to wait much longer for the lady I got up from my nap to see finish. Jenn Ennis is another of the charter members of the Angels division of my club. I had met her before I ran my first ultra when I became an active member in the NCRC back in 2001. It wasn't until around early 2005 that we started to become closer friends and since that time I've been lucky to have gotten to know this special lady quite well and share frequent training runs together. Sadly I was unable to run her first 50K with her two years ago due to my training for Boston but she ran a great debut in a time it took me 3 years to run. She followed that shortly with a 50 miler in 10:07 at Umstead 2006. I told her then then she was a natural at the sport as her training was even less than mine. 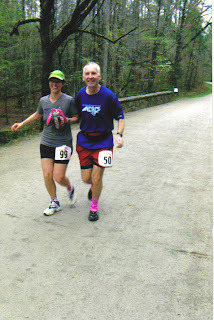 I was finally able to run an ultra with her at the 2007 Frosty 50k. She improved a little despite slowing due to shin pain that nearly turned into a stress fracture and caused her to miss last years Umstead. I was happy to learn that she intended to run the 100 this year. I knew she would do great despite less time to train than she had hoped for. She had expressed doubts on numerous ocassions that she was ready but I assured her that she would not just finish but would run under 24 hours. At the pre-race dinner Friday night someone asked her what made her decide to run ultra's. She just pointed at me. Well, I'm not sure can take credit for that but hopefully my enthusiasm did rub off on her and provide some inspiration. Well as predicted she had a great run and finished in 23:30 and when she walked in the lodge with that big beautiful smile, she looked like she could go out and run another 50 miles. Like I said, she's a natural and I'm sure she did it on even less training than I had for my first. Congratuations to all the other finishers as well as the other first timers. Nice report. As usual you mention others before yourself. You are a true ambassador of our sport and represent all the positive qualities that ultrarunning is known for. Wish I could have run with you more this year but I was having a hard time keeping up with John Straub (I was his pacer) as he worked for that 10th place finish. Hope to see you at a race soon.